Here's an interesting conversion project signed by Bernard Gallay at Bernard Gallay Yacht Brokerage - a 30m motor yacht called Lutteur. 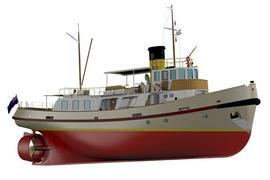 She was originally built by France’s Forges et Chantiers de la Méditerranée in 1963 as an oceangoing tug and is now partly through a major conversion into a luxury motor yacht. Lutteur has been completely stripped down, sandblasted, treated and repainted. New metalwork has been carried out including a new wheelhouse, funnel, and midships section. All the systems have been renewed and the work has been done under Bureau Veritas classification. There are of course many possible versions for finishing the boat depending on the new owner's wishes. Designs and plans are available for several versions and Lutteur is asking €230,000.